It was with some trepidation that I slid the disc into the car stereo; as it’s well documented that I’m not Mr. Bonamassa’s biggest fan but the power chords of the opening instrumental track; Hey Baby (New Rising Sun); which acts as a sort of prologue, kept my attention and then Bonamassa sings the opening verse of ‘Oh Beautiful!’ Without any accompaniment I definitely became interested; and the track itself sounds very Jimmy Page influenced but never sounds derivative; if that makes sense. New Yorker, Bonamassa has always sited the British guitarists like Page, Clapton and of course Ireland’s Rory Gallagher as influences on his own style of playing; and on DIFFERENT SHADES OF BLUE he sounds like he’s having a blast paying homage to these players and more. It may surprise some people who know my writing; but the title track ‘Different Shades of Blue’ has already been added to two playlists on the i-phone for car trips; it did take a few listens for the penny to drop but Bonamassa’s voice sounds exceptional and the guitar playing sounds uncannily like the under-rated Gary Moore; and that’s no bad thing in my book. The guitarist even throws a curve ball by including two blistering R&B songs that had me wanting a whole album sounding that good. The brass section on ‘Living on the Moon’ and ‘Heartache Follows Wherever I Go’ swing like Glen Miller but with guitar playing so fiery you half expect sparks to come out of the speakers and again; Bonamassa’s voice is to the fore sounding fuller than I’ve heard before. Another track that has been pilfered for a couple of playlists is the love song ‘So What Would I Do?’ That closes the album. 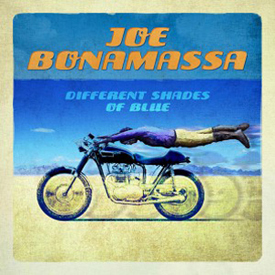 The song begins with some cool piano tinkling before Bonamassa discovers his Soulful side and goes into Blues crooner mood with a string section that swoops in and out like a host of Angels. This is another song that left me craving a whole album in the same style. DIFFERENT SHADES OF BLUE probably follows on more from the recent Beth Hart collaborations than his previous albums; and the tempo throughout has definitely converted me while regular fans still get a nice dose of quality guitar playing; but I guess they’ll be a lot happier when these songs are performed live, as each solo will be doubled in length!